In the search for extraterrestrial life, we have only one example of a biosphere to guide us: our own. In searching for the biosignature gases of an alien biosphere, we are really searching for Earth twins. Not only that, most work focuses on finding planets that are modern Earths twins. But the story of life on Earth spans billions of years. The early biosphere was very different from that which we see today, and the biosignatures of life it generated were very different from what we put out in the modern day. Other planets were not formed at the same time as Earth; some will be much younger, and some much older. If we wish to search for other Earths, we must be sensitive to worlds of all ages: young, middle-aged, and old. While previous work has assessed the biosignature atmospheric gasses generated by the modern earth and even by the young Earth, this paper focuses on Earth of the far future, when the biosphere begins its slide into oblivion. This paper asks how the planet — and resulting biosignatures — will look billions of years in the future. By knowing what an old Earth looks like, we’ll be able to identify an old Earth when we see it. So what does Old Earth look like? The driving factor shaping the future of Earth’s biosphere is the Sun’s luminosity, which increases over time. 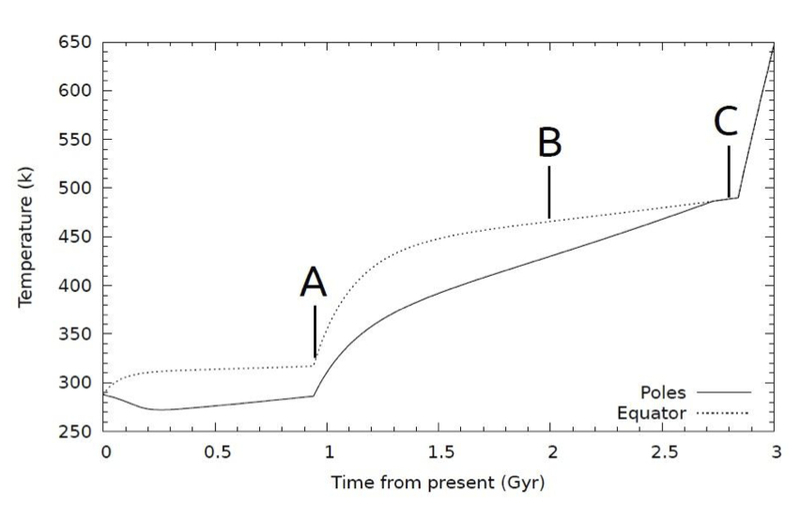 The authors identify three important future eras driven by the Sun’s evolution, shown in Figure 1. Figure 1: Predicted changes in Earth’s surface temperature over time, measured from today. The dotted line represents the equatorial temperature, and the solid line the polar temperature. A demarcates the fall of multicellular organisms, B is located in the epoch of rising temperatures and falling O2/CO2 levels, and C is when the planetary surface becomes uninhabitable. The Earth has a coping mechanism for rises in solar luminosity, in the form of the carbon cycle. 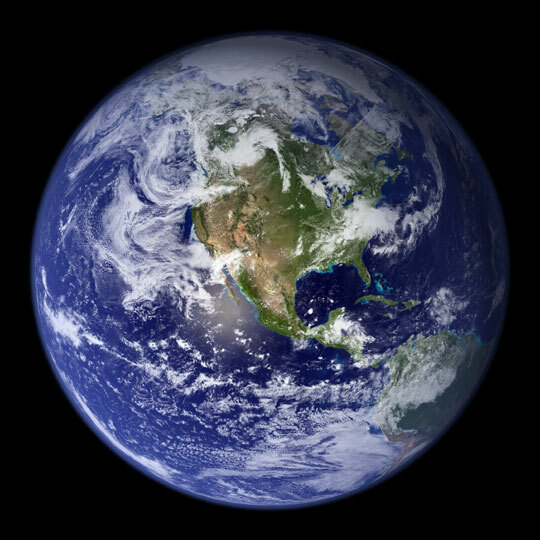 As the planet heats up, more water is evaporated and more water falls in the form of rain. When it does so, it takes up CO2 from the air to form carbonic acid, which reacts with the rock of the Earth to form carbonates. The removal of the CO2 from the atmosphere reduces the greenhouse effect, and the Earth cools. Eventually, however, atmospheric CO2 will begin to run out. A billion years from now, at the point marked “A” in Figure 1, the authors predict it will drop so low that plant species will no longer be able to sustain the highly efficient photosynthetic processes that keep them alive. Plants will die out, and with them the animals that depend on them for food. The only survivors will be microbes. By concentrating what scarce CO2 there is, or by using alternate energy generating pathways like iron and sulfur oxidation, many microbial species will endure – for a time. With less photosynthesis occurring and many energy-generating pathways requiring free oxygen, the authors predict that over time the biosphere will also draw down its supply of oxygen. Aerobic microbes will die out; as it was at the beginning, the Earth will become the provenance of anaerobes. Yet even this is not the end. With the stock of atmospheric CO2 depleted, the carbon cycle will no longer be able to regulate planetary temperature. Temperatures everywhere will begin to rise, with the equator heating faster than the poles. This is depicted in the area marked “B” in Figure 1. Past 420 Kelvin, no microbe known or anticipated can survive. And so, life will begin a slow retreat poleward and upward, until it is finally confined in isolated reservoirs: huddled on top of high mountains where it is still cool, or hidden in subsurface environments and caves. The authors predict that 1.85 billion years from now, Earth’s surface will be uninhabitable. In 2.8 billion years, the underground reservoirs will also become uninhabitable, and terrestrial life will become extinct. This is the time marked “C” in Figure 1. 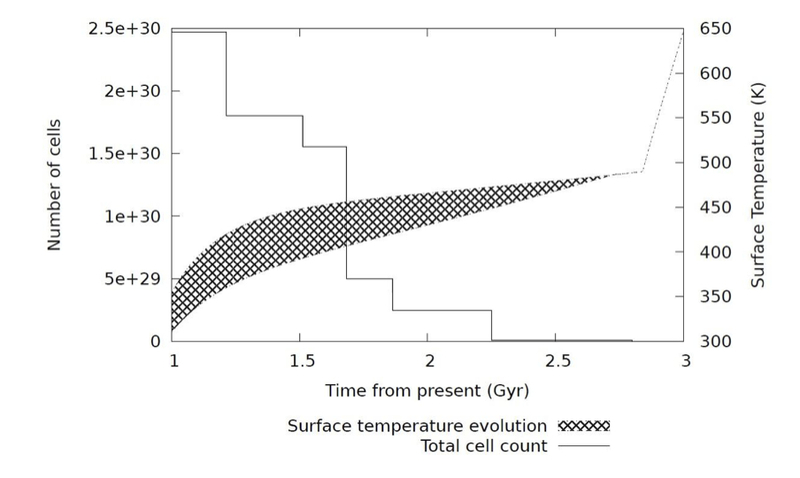 Figure 2 shows the time-evolution of planetary biomass in the context of changing temperatures. Figure 2: Planetary temperature over time coplotted with the change in biomass. The shaded area represents the temperature range from equator to pole. At 2.8 billion years from present, life is predicted to be extinct on the surface. How Does This Affect Biosignatures? So how does this tragic story affect the biosignatures of the terrestrial biosphere? The authors identify a few key points. First, during the predicted extinction of multicellular species, organic decay will produce a large amount of methane. Methane is an important biosignature gas because it is one of the most detectable. If the die-off is rapid, the amount of methane in the atmosphere will increase by an order of magnitude, which would strongly enhance its detectability. However, the authors argue the die-off will occur over an extended period of time because organisms will display variation in how well they are able to adapt to the changing environment. With a long die-off, the methane signature will not be as strong – but might persist over a longer period of time. Other by-products of decay include methanethiol and the latter’s decay product ethane, but these too would be much weaker if the extinction occurred over a long period of time (~100 million years). Second, as CO2 levels drop and photosynthetic O2 production declines, the amount of O2 and O3 in the atmosphere will also precipitously decline. These key biosignatures for the modern Earth will quickly drop undetectable levels. Similarly, CO2 levels will be much lower than for modern Earth, and will continue to decline. H2O will remain abundant in the atmosphere and will get more so as the planet heats – until photodissociation destroys it all as the planet transitions to a Venus-like state. In this case, the Earth will acquire an H2 envelope that would be detectable. H2 is not a traditional biosignature. Overall, it will be much more challenging to detect traditional biosignatures in the atmosphere of a dying planet. Life that persists in caves and subsurface reservoirs is unlikely to produce significant biosignatures detectable from space. However, the authors speculate as to another refuge: clouds. It is speculated that life on Venus, if ever present, may have escaped to the clouds, where conditions are much more conducive to life. Dust particles from a desert planet are likely to generate clouds with small droplet sizes. If clouds with large droplet sizes are present, it would suggest the existence of larger seed particles: microbes could act as these seeds. This measurement is theoretically possible, but out of practical reach at this time. In sum, as one might expect, a dying Earth will have much weaker biosignatures. However, mass extinction events, if rapid enough, may release enough decay gases to significantly enhance detectability for a short period of time. Editorial Note: This may seem a rather depressing article: it foretells the doom of life on Earth, after all! However, this article assumes that terrestrial life will take its doom lying down…and we humans aren’t such pushovers. Work is already underway to identify means to move our planet outwards to compensate for the Sun’s increasing luminosity. If we humans can avoid catastrophe and continue to work together and progress in science and technology, I have not the slightest doubt that the Earth will endure billions of years hence. After all, if our mother planet doesn’t qualify as a species heritage site, what does? Editorial Note 2: On a final note, this is my last post for Astrobites! It’s been a blast writing for the site. Thanks for reading, and I hope you continue to find Astrobites a useful tool! Many thanks for all of the posts you’ve contributed. Your work has been much appreciated.